Our favorite, tail-wagging event is back again this Super Bowl Sunday! Animal Planet will win over our hearts and spirits February 7th with Puppy Bowl XII. The Puppy Bowl is more than just a cute event before the Big Game, it is a stroke of marketing genius. Who doesn’t love watching a two-hour program devoted to nothing else, but puppies with a kitten halftime show? 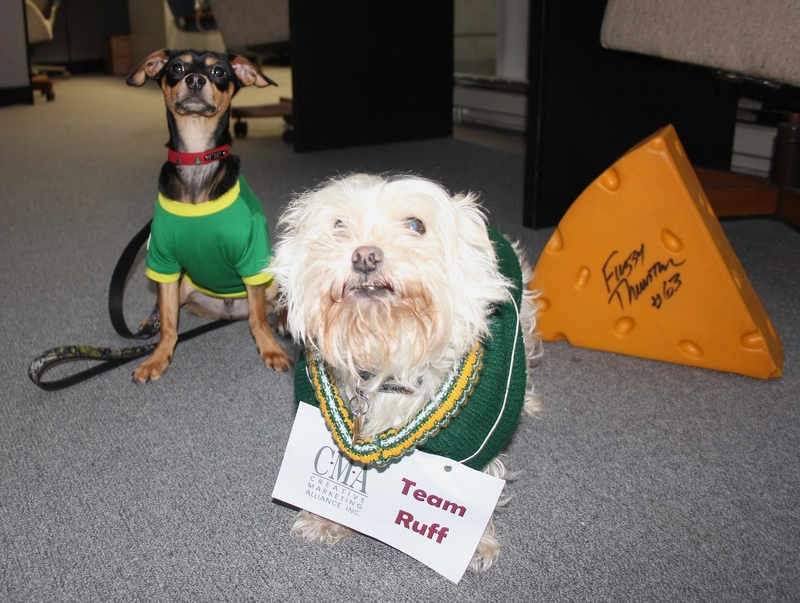 Babe shows her support last year for last year’s Puppy Bowl Team Ruff’s Maddux. The answer is no one. Everyone loves animals and the Puppy Bowl is a testament to that. The Puppy Bowl understands its audience and what is important to them and through its marketing and advertising offers up a pawesome combination of advertising and sponsorship opportunities to reach a very specific audience while showcasing animal rescues from around the country. Full Disclaimer: CMA is a huge advocate for animal rescue, the majority of the animals at our pet-friendly office have come from rescues and shelters. Animal Planet knew what market it was trying to attract with the advent of this adorable pet-filled alternative program to The Big Game. It was trying to create a family-friendly program that mirrored the popularity of The Big Game. By knowing your audience or whom you want to reach, you will be able to communicate a stronger message and receive better traffic to your content. The scores of pet food and product companies know they will be reaching people with a vested interest in animals, particularly dogs. It’s important to know what is popular within your market and how you can capitalize on that to receive the best results for your business. According to a 2015-2016 American Pet Products Association (APPA) National Pet Owners Survey an estimated 54.4 million U.S. households own a dog and 42.9 million own a cat. The APPA reported in 2014 that Americans spent $58.04 billion on their pets, which was projected to reach $60.59 billion last year. These statistics show the market for pets in America is huge. The Puppy Bowl is the perfect opportunity to launch promotions and commercials throughout the two-hour program to showcase a new pet supply or service. How can you apply a similar practice into your marketing strategy? Find spaces or platforms that make sense for your business and use them. This is a full-proof method to reaching your target audience. Perhaps one of the best marketing tools for your organization is showing you are socially responsible. All puppies and kittens showcased throughout the Puppy Bowl are from local adoption agencies and available to adopt and bring to your very home. Find causes or charities that make sense for your organization to get involved with. Taking the time to volunteer will humanize your business and show that your company is filled with real people who want to make real change.